The kids will be back to school on Monday. Best to keep school children away from germs, Unilever Philippines and Domex brought the #1MCleanToilets movement to public schools through Department of Education's Brigada Eskwela at Gregorio Del Pilar Elementary School in Tondo Manila last Thursday in partnership with the local government and Unicef Philippines. I was with fellow bloggers who witnessed the Brigada Eskwela of Gregorio Del Pilar Elem. School last Friday with parents and teachers who cleaned the toilets with Domex in preparation for school opening on Monday. 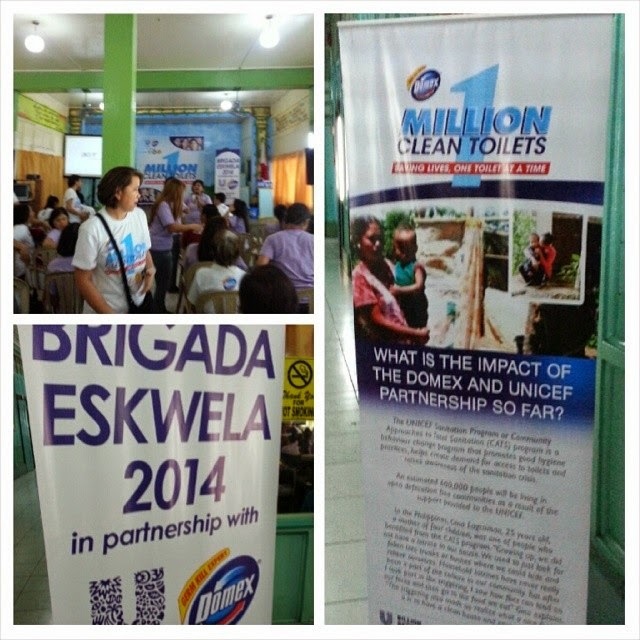 Unilever Philippines and Domex taught the teachers and parents how to properly clean the toilets in schools and at home. First, use hand gloves or masks when necessary. Use Domex Extra Thick Bleach on the rim and leave it for 5 minutes. Use scrub and brush to clean the inner rims and edges before washing them off with water. I have been using this product for a long time now since I've always hated the smell of Muriatic Acid and ordinary bleach is just too strong also for my nose. What I've learned that day was leaving it for 5 minutes before brushing and scrubbing the floors and edges. 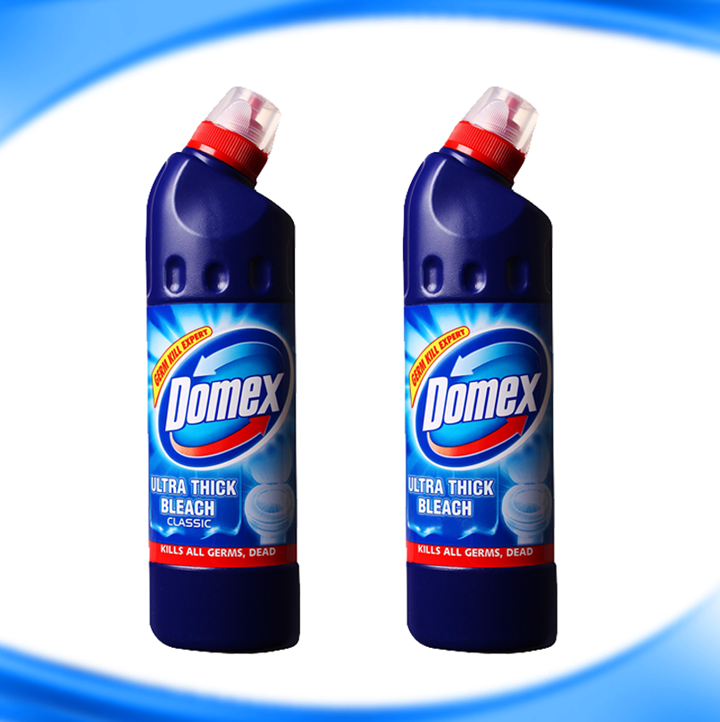 I was surprised realizing that Domex has an easy-to-open and easy-to-keep sachet which is more affordable than the bottle. I loved that the design has a particular spout to easily spread on the innermost part of the toilet bowl rim so I need not stain my hands with any surface of the toilet bowl. The school kids will be back tomorrow and it would be best to always keep the toilet safe to keep away from diseases. Diarrhea, being a common disease among children who use dirty toilets will be avoided if we keep supporting Domex Philippines' One Million Clean Toilets Movement. 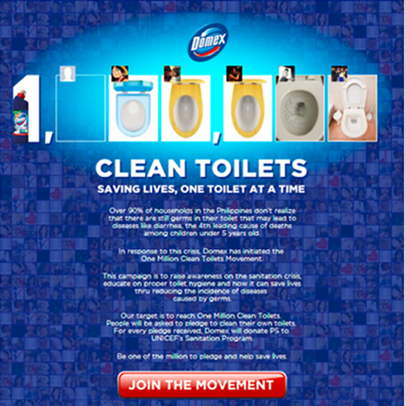 Unilever and Domex Philippines will donate P5 to Unicef's Sanitation advocacy to help clean more toilets. From malls, offices, gas stations, the #1MCleanToilets movement continues to ask support and you can help by simply pledging on their official Facebook Page. Accessible app only on desktop, like https://www.facebook.com/DomexPhilippines and click the Pledge Here Tab https://www.facebook.com/DomexPhilippines/app_ to help. The fate of our school children is in your hands. Please do SAVE LIVES ONE TOILET AT A TIME.